Not to be confused with Pufftup. 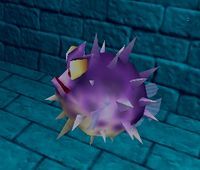 Puftups are blowfish like enemies that inhabit the waters of Crocodile Isle and Donkey Kong Island. The word Puftup is a reference to how the Puftup is "Puffed Up". Puftups first appear in the game Donkey Kong Country 2: Diddy's Kong Quest as semi-common enemies. They have two attack patterns in this game. In the first attack, they will inflate, thus growing large in size, making it hard for the Kongs to avoid them. They will also inflate themselves to the point that they'll explode and hurl spikes throughout the water. Puftups can only be defeated with help from Enguarde the Swordfish, who can beat them with his sharp nose. Puftups also appear in Donkey Kong Country 2's pseudo-sequel, Donkey Kong Land 2. Although they have the same appearance in this game, they do not explode to attack anymore. This was likely done because of system limitations for the original Game Boy. The next appearance of Puftups is in Donkey Kong 64. The Puftups of this game are oddly purple and are often stationary, but if approached by a Kong, they will explode spectacularly. This effectively makes them aquatic mines. Also, the boss of Gloomy Galleon in Donkey Kong 64 is a giant Puftup named Puftoss. After a long absence, Puftups return in DK: Jungle Climber, where they can only be defeated by a charge attack when they're deflated. Puftups were originally going to appear in Donkey Kong Country, with blue tail and fins, but were removed from the final version. 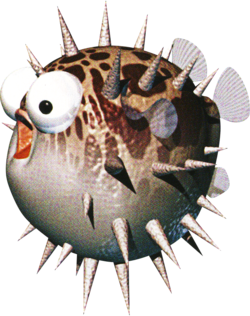 In the game Banjo-Tooie, the Puftups were recycled into the Swellbelly enemy. The Swellbelly is almost identical to the Donkey Kong 64 version of Puftups, the only difference being that it is colored orange and is fought slightly differently, swelling larger but not exploding. This page was last edited on January 28, 2019, at 03:04.